Last week, we finished this sweet, funny little novel, the first in a series of three about the adventures of Elmer Elevator and the dragon he rescues (not to give away the ending). Like most adventures, it is the journey rather than the arrival that is most delicious. Before Elmer embarked for Wild Island, we made a list of things we’d want to take on such an adventure. 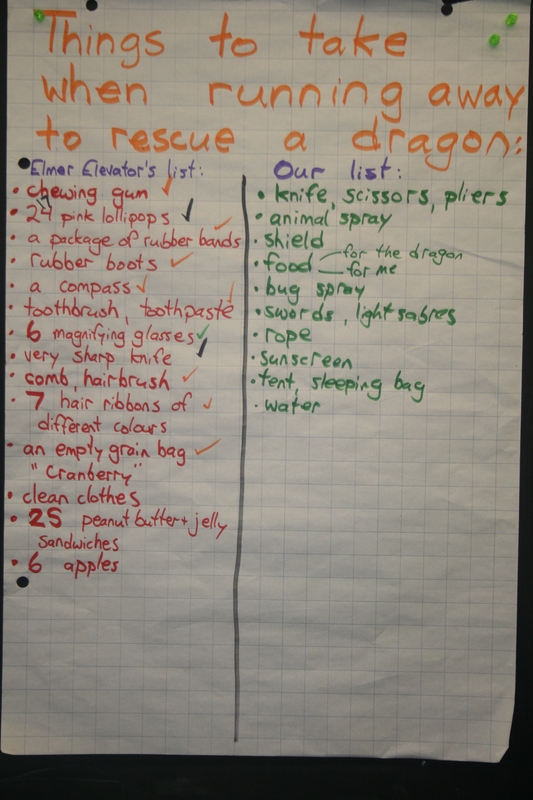 We then read the surprising list of things that Elmer carried in his backpack. Part of the fun was checking off the list as they were used in such surprising ways (though he never seemed to use the clean clothes–clearlyhis priorties are solid). Why do I choose such an old book (published in 1948) to read to today? Like the Thornton Burgess books, it has a gentleness to it–a lack of cynicism, a lightness, that in spite of (because of?) the onslaught of fast-paced media and violence the children are thirsty for. It is almost like a relief to them to experience a tale so unflashy. And there is wry humour and not-hit-over-your-head wisdom in these stories, and inspiration: as the children are asked to take on more and more responsibility for themselves we are mightily impressed with a fellow who can be so self-reliant (and who can largely survive on tangerines). How can we not imagine ourselves there? 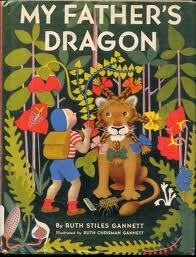 Besides, given all our “knight” metaphors, it’s never a bad idea to see that even a dragon can be a friend. (Now there’s a metaphor I could extend in some interesting directions). There’s a reason the book has never been out of print in more than 60 years: it’s a gem. I think I may not be able to resist launching into the second book next week, but I doubt many would object to reading the first again at home! How else are you going to find out how to make a bridge with pink lollipops? For this post, I wanted to step back and look at the fundamentals of what we are doing in our exploration of the English language (a language sadly maligned by misunderstanding and misinformation). For years, teaching Grades 4 and 5, I would tell my students, Sorry, English doesn’t make any sense, we’ll just have to muddle through. I expect many of us were told or came to believe this as we were growing up. The fact is, throughout school systems children are taught that English is full of “tricky words”, “exceptions”, “rule breakers” and so on–words for which their was no explanation, that simply had to be memorized and endured. Keep reading. About eight years ago, I was introduced to Real Spelling, a linguistically accurate resource for teaching the English writing system, and it was like the lights had just been switched on. I discovered that my sense of the language had been quite backwards. It was if I had been teaching cello, saying, Sorry, I don’t have any understanding of this strange instrument, but neither does anyone else--and then spending years banging the instrument with the bow. I am no longer banging the instrument (or my head). English spelling makes sense: it is highly ordered and contains very few exceptions. Inquiry-based learning: The second part of my journey has also come through my dear friend Pete Bowers, who took the Real Spelling resource, and really developed a methodology for exploring the language, as well as providing the research. Through Structured Word Inquiry, we always ask why a word is spelled the way it is. We do this through looking at its structure. 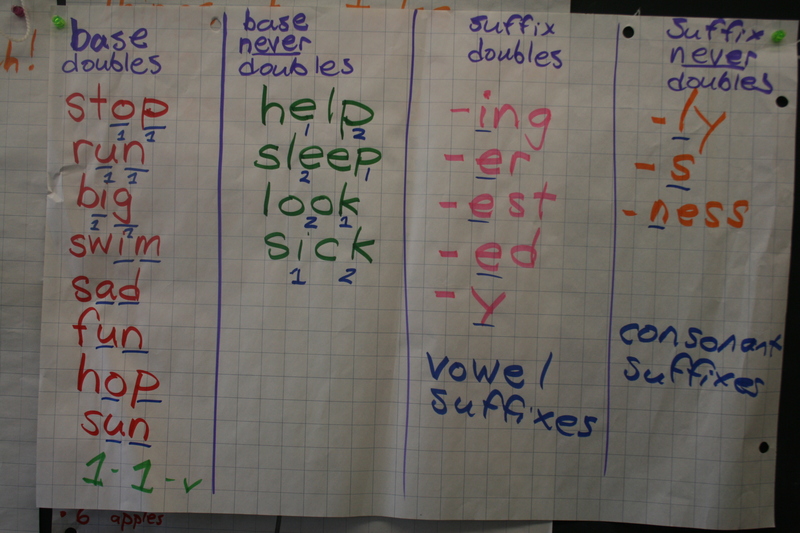 As Abdul said, “We take apart words and we put them back together.” We always look for its base, and we use our knowledge of suffixes and prefixes, and of graphemes to help us. 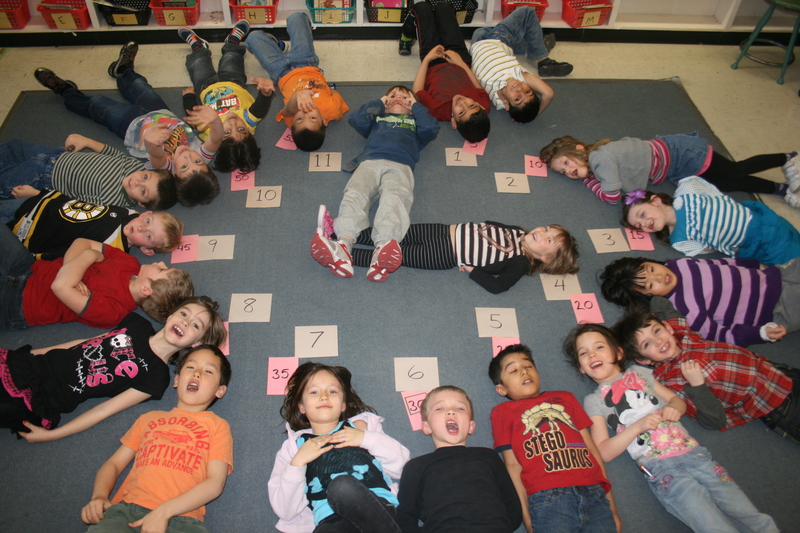 (Our students understand two fundamental truths: that letters can work on their own or in teams (graphemes, including digraphs and trigraphs) to represent sounds (phonemes); and that many graphemes can represent more than one sound. Rather than being a problem, this is seen as a normal and useful function of the language. See our work with homophones, below). When we discover a word that has a spelling we cannot initially explain, we become word scientists: we investigate it. We take the knowledge we already have, and we create hypotheses, test our ideas, find connections and patterns and new questions, make discoveries, expand our understanding! In this way, we not only learn how our language works–rather deeply supporting our reading and our writing–but we also learn how to learn. By giving the children ownership of this learning, guided along by some of the choices I make about priority or direction, they are more engaged and, I believe, more likely to remember what they have learned. And I hope it encourages them to be active, questioning investigators in all things! For weeks, we collected words where the silent <e> was dropped, then we sorted them by suffix and then analyzed the suffixes. Voila! A clear, consistent pattern. Reyad came across the word <living> in a book he was reading, but did not immediately recognize it, and was not getting it from context. First step: find the base (the single largest unit of meaning). He did this by removing what he guessed was the suffix <-ing>, leaving him with <liv>. He now thought he knew the word, but was troubled by the spelling. 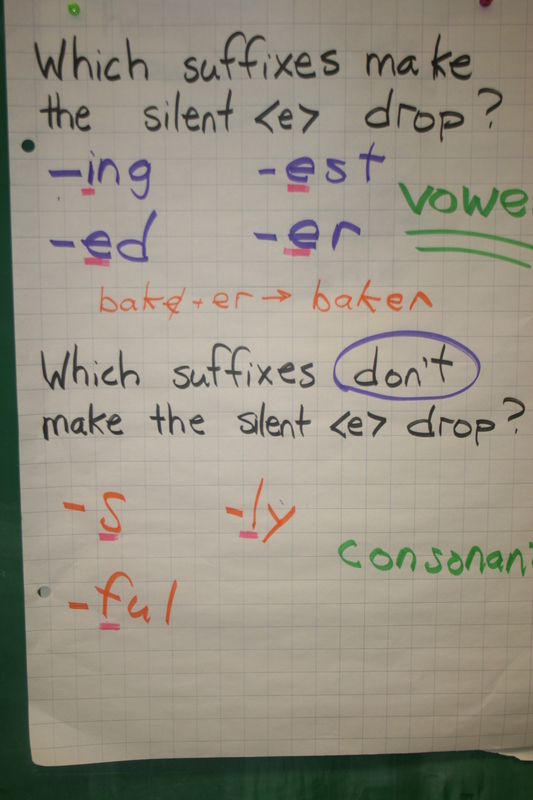 He now applied two pieces of understanding: no English word ends with <v>, and this is avoided through the convention of applying a silent <e> (previous examples discussed include <love> and <have>); and, a silent <e> is dropped when adding a vowel suffix. And so, he concluded correctly, the spelling must be <live>. I note how this attention to structure helps to unlock meaning in reading–all of this process happens in seconds, and it happens all the time. When your child is reading, among the strategies you may prompt them with is, How is the word built? (This could mean, What is the base?, Do you see any suffixes? and/or Are there any digraphs or trigraphs you recognize?). A question that floats about is why there is a <w> in the word <two>. Recently, we were discussing the word <twice> because it turns out several of our words in the hall appear that many times (oops). How many times is that? “Two times!” Hmmm. 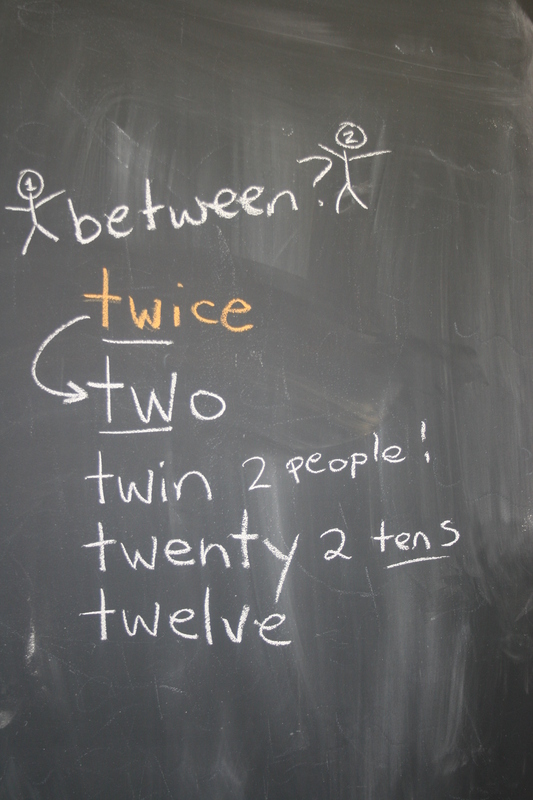 What do the words <twice> and <two> share? Meaning, and spelling! Together we compiled the following list of words that–by no accident–share the meaning and the <w> of <two>: twice, twin, twenty, twelve, between. I expect there may be more–what do you think about <twine> and <twirl>? The theme here is one of etymology–that words that are related in meaning or history very often share aspects of spelling. This, too, is a normal and helpful function of the language. So, I don’t expect you to believe the bold statement above, yet. I hope this gets you thinking about why words are spelled the way they are. You may find that you cannot help but begin your own investigation (feel free to share). I trust that as you do, you will find your faith in the highly sensible English language grows more and more. Want more information? There are links throughout this post that will take you to a treasure trove, as well as the awesome blogs in the sidebar. (Want less information? You probably stopped reading a long time ago). Finally, in this video, made in my class two years ago by Pete, you can glimpse some of the investigating, the attention to word structure, the process of discovery (especially at the very end). In particular, notice the highly important habit of spelling aloud in a way that highlights structure. One of the basic prompts I give children when they are stuck on a word is “spell it” as Reyad did independently, above. In doing so, they pay attention to the structure and many times unlock the word, while I, beside them, am able to instantly able to assess their understanding. I will say of this video that my practice is evolving, and just this year I have shifted from using the term “letter team” to the more accurate terms “digraph”, “trigraph” and so on. But this is still reflective of much of what goes on.